Since it is no longer a secret as to where I am spending Pesach, I decided to share the following thought. One night a man had a dream. He dreamed he was walking along the beach with the Lord. Across the sky flashed scenes from his life. For each scene he noticed two sets of footprints in the sand: one belonging to him, and the other to the Lord. The Lord replied: "My son, my precious child, I love you and I would never leave you. During your times of trial and suffering, when you see only one set of footprints, it was then that I carried you." That text is well-known, and while its precise source is debated, it is of Christian origin. Yet I came across it about twenty years ago in a contemporary charedi sefer of parashah vortlach called Yalkut Lekach Tov. It presented the Footprints text as being a parable stated by "an Adam Gadol." At the time, I was very much into a black-and-white understanding of the principle of "Torah b'goyim, al ta'amin." God spoke to the Jews through the Torah, and not to anyone else. I took great pride and dignity in the difference between Jews and non-Jews. Yet here was a Christian parable being presented in a super-frum parashah sefer! This was one of the many things that led me on the path of realization that things were not always as black-and-white as I had previously thought. Anyway, when I encountered the Lord on the beach yesterday, he made a similar offer to the Lord on the beach in the parable. He was telling my wife about how bad he feels for wives who have to suffer their husband's books being banned, and he said that if we are ever feeling down, we should just write to him and he will call and offer whatever chizzuk he can! Needless to say, no other Knight has ever offered to save me from distress. Which left me pondering a thought that was very appropriate for Pesach: It was nice that this knight was different from all other knights!
. . . If He didn't, since all the surrounding gods _did_, we would not have taken Him seriously. It's not just that things aren't black and white -- it's that there's more than one beam of light in the darkness. The Sufi understands that although God is the source of all knowledge, inspiration, and guidance, yet man is the medium through which God chooses to impart His knowledge to the world. He imparts it through one who is a man in the eyes of the world, but God in his consciousness. It is the mature soul that draws blessings from the heavens, and God speaks through that soul. Although the tongue of God is busy speaking through all things, yet in order to speak to the deaf ears of many among us, it is necessary for Him to speak through the lips of man. He has done this all through the history of man, every great teacher of the past having been this Guiding Spirit living the life of God in human guise. In other words, their human guise consists of various coats worn by the same person, who appeared to be different in each. Shiva, Buddha, Rama, Krishna on the one side, Abraham, Moses, Jesus, Mohammed on the other; and many more, known or unknown to history, always one and the same person. Not that I'm suggesting you should become a Sufi. I'm afraid that you may be over-estimating the intelligence of the internet. I hope that I'm wrong. Also, did he say anything about wives who lose their husbands to blogging, even during vacations ;). Well, let's see how many people notice the two jokes in the third paragraph from the end. Okay, I admit it--I didn't catch the jokes. But probably if you have to explain them, they won't be funny anyway. By the way, one acquaintance of mine in college was a Black Muslim. He told me an interesting thing: He said that in Islam they would object to the "footprints" parable, even though the message it teaches is a good one, because Islam is very particular about not having any anthropomorphisms of G-d. The fact that it was a non-Muslim author who penned the idea didn't bother him. Yehudah: Targum Onkelos would probably have the same problem. Oy! The ending to that was so bad, your blog posts should also be banned! Actually I have to give credit to the Lord, he made a similar joke in one of his talks, quoting the Queen. I actually heard that joke about "Why is this knight ...." about Rabbi Jakobowitz. I heard it before Rabbi Sacks was considered for the job. He is not Charedi, so plagiarizing is a minor sin, but I mention it for accuracy's sake. maybe if you are sad you can listen to blues played on the sacks for you? sorry....yours were much, much better. 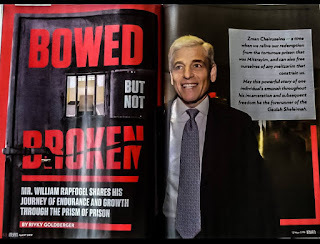 I found the following very nice story first on a Christian website and then, with slight modifications, in a frum magazine. I suppose it is possible that Jews came up with it first, but I suspect not. Except the one time a book of the "Lord'" was banned he completely rewrote it! Actually, I think it is the other way. That is, R. Slifkin, I believe, is in a position to give the "Lord" a lesson in courage, of how to stick to one's guns when under genuine fire, as opposed to trying to appease one's Hareidi critics, which never works anyway. The Chief Rabbi caved in to? That's great! Now I can enjoy his gifted writing without violating my standards. Thank you very much. Thanks for the link to the ftjt article. Glad to see that the program is kulo lsheim shamayim. "That text is well-known, and while its precise source is debated, it is of Christian origin." It is even more well-known, that Christianity is of Jewish origin. So you are suggesting that we should just go ahead and learn the New Testament? Paul, whom was believed by many to be a Jew and who was influenced by Peter's and Jesus's teachings, and whom are likely, in world opinion the most famous Jews, (besides Moses and Abraham) authored the New Testament, containing (some if not many) Jewish and moral concepts. The author in Yalkut Lekach Tov, whether known to him or not being of Christian origin, recognized the footprints concept, as being well enough to be considered a Jewish one. Most likely, given the origins of Christianity, was devised by a Jew. However, if one wishes to study the New Testament, they should with the same scrutiny, even perhaps more so, as given when learning the Gemara. A lot of the Christian scriptures "read" like early Rabbinic literature (concepts, language -- accounting for translation, even some of the characters). Unsurprising given the provenance of these works. Isaac: It's kind of unlikely, to say the least, that any Christian text written after about the year 200 or so was written by someone who was originally Jewish. How touching! As Rabbis Slifkin and Sacks walk along the California coast after enjoying their S11,000 per person Passover experience, they contemplate those benighted Chareidm tormentors back in Yerushalayim and Bnei Brak who are simplay unaware of what true ruchniyus should be. LOL! Actually this program is not quite my style (I'm from Manchester! ), though I'm not complaining. But what got me contemplating "those benighted Chareidm tormentors back in Yerushalayim and Bnei Brak" is an amazing plesiosaur skeleton that I saw yesterday at the Discovery Cube in Orange County. It's something real and amazing from Hashem's world, and yet I can't display it at my museum, because charedim can't handle it. Such is the price that is paid for "true ruchniyos." Please, stay in Orange County and spread your 'natural Torah' on the beach. I am sure that you will find an admiring following and become very rich and famous. Perhaps you can study with your friends inteh hotel the 'rationalist' Rambam in Shemoneh Perakim - Chapters 4-5 (yes, we know your methodology, you can pick and choose now one out-of-context citation that fits your worldview). Whereas you follow the Rambam whether he fits with your worldview or not? The Rambam in Maddah says you should shower once a week. Is that your practice? BTW, your naked kinnah of the people in the hotel is rather unbecoming. Rabbi Slifkin, Can you please post here, the picture of the Plesiosaur Skeleton for our enjoyment and education and to contemplate HaShem's wonderful creations please. afrumrabbi: Do you only accept employment and donations from people below a certain income level or that otherwise live as you do? It's people like Rabbi's Sacks and Slifkin who bring people closer to Hashem and Yahadut by exploring his wonders in a positive way. It's "Rabbis" like you, who are so negative, that drive people further away with your negative, biting, sarcastic tones. Thank HaShem we have Rabbis like them. Chaval Alenu we also have "Rabbis" like you. you obviously are oblivious to the 'spirituality' of the prime passover vacation experience - sorry, it's almost YomTov here in Yerushalayim - I must hurry to join my parasitic friends in the lap of luxury. Actually, we wish we had enough donations. And your not even right about one thing! Why don't you eat Matzah with salt and drink water by measure, isn't that the way of Torah you practice, or only preach? How is having a program with the Kardashians "kulo lsheim shamayim"
Read the 5tjt response linked. It claims that those elements were not part of the program. "This was one of the many things that led me on the path of realization that things were not always as black-and-white as I had previously thought." This is the key line in the entry. It is only a mature faith that sees the grey. Many "religious" people (frum yids, Bible-thumping Protestants, St. Pius Xers; it makes no difference, take your pick) never attain the realization that things in God's world are not always as black-and-white as they previously thought, or had been led to believe. People who see only black-and-white are spiritually color-blind. The parable you mention which is of Christian origins reminds me of an amusing story my wife told me a few years ago. My wife is at work and walks in on a non-Jewish colleague talking about a story he had heard about the evils of gossip. In the story a known gossip is struck with a terrible illness and all the town's doctors are of no avail. So, the gossip goes to town's wise man who tells the gossip to take a down pillow to the bell tower and open it up and cast the feathers to the winds. The gossip does so, but feels no better and returns to the wise man to complain. The wise man says, you must go and collect every last feather, then you'll be cured. The gossip says that is impossible, the feathers have been carried to the ends of the earth. The wise man says, yes and so too with the gossip you spread which can never be taken back. My wife says, oh I know this story. The wise man is a great Hassidic rabbi, I think. The colleague says, what? The priest told this story during his Sermon on Sunday. It's about a 16th century Saint named Philip Neri. My wife is shocked and goes and looks it up and sure enough, it's a Catholic story about St. Neri and is about the Catholic concept of "calumny" (injuring reputation through slander). If you google the outline of the story (feathers gossip wind) you'll find many Jewish sites referencing the story such as Chabad. I think Rabbi Slifkin and others are rather confused as to the meaning of "chochma bagoyim ta'amin, Torah begoyim al ta'amin". The two stories - footprints in the sand, and the feather pillow - are nice illustrations - but only illustrations ("chochma") of Torah principles. It is well known that Christianity is made up of Torah principles, and non-Torah principles. ALL the good Christian ideas originate in Torah, and ALL the bad ideas are Christian inventions. It is a very arrogant position to take in believing that the Jews are the sole possessors of all wisdom. Confucius preceded Pirkei Avot by 100s of years. Tamar, you familiar with the no true socttsman fallacy? Tamar, which came first? Papal infallibility, or Gadol Worship/Daas Torah? It's a case of the the chicken or the egg. I believe with perfect faith in the (re)posting of shlisel chala posts. And even though he may tarry, nevertheless I await his posting every day. I saw books referring to the story as originating with Philip Neri, but no sources. I read the article that was linked at the very beginning of the blog post. It says the Kardashians (and Ariana Grande) were part of the "Prime Experience." That implies to me that those activities were made available through the pesach getaway company in some manner. Maybe only to people who paid a lot money, but it was still an activity that was scheduled and enabled by the pesach people running the week.